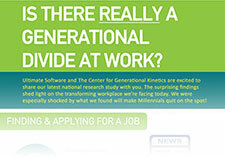 See the results of this national research study on Millennials and other generations in a graphically illustrated format, by Ultimate Software and The Center for Generational Kinetics. Learn some surprising facts about succession planning, and gain a better understanding of why future-proofing your business is more important than ever. Check out this fun, visual game plan for nurturing your top performers that you’ll surely want to pass along to your coworkers!